Another jobs report, another blowout gain. Despite what some market participants may feel, the labor market doesn’t show any signs of a slow down. Throw in a continued stream of earnings and that’s a lot for investors to digest going into the weekend. Let’s look at a few must-see stock charts. Despite beating on earnings estimates, Amazon (NASDAQ:AMZN) stock is down about 5% after the company talked about higher spending and provided a weaker-than-expected outlook on first-quarter revenue. Currently down near $1,630, shares are just below the 21-day moving average, but still above the 50-day near $1,600. That level also served as decent range support once extreme bouts of fourth-quarter selling subsided. Missing required attributes. Please edit. So what now? I would like to see Amazon stock stay above the 50-day moving average. Ultimately though, bulls are still okay so long as AMZN stock stays above the backside of prior downtrend resistance (blue line). If it begins to rally again, look to see how it does with the 200-day moving average and $1,750. Shares of Chevron (NYSE:CVX) are rallying after the company beat on earnings estimates and missed on revenue expectations. The move comes after the stock consolidated and drifted higher near the 21-day and 50-day moving averages. Now pushing through the 200-day, it will be interesting to see if CVX can stay above this mark. 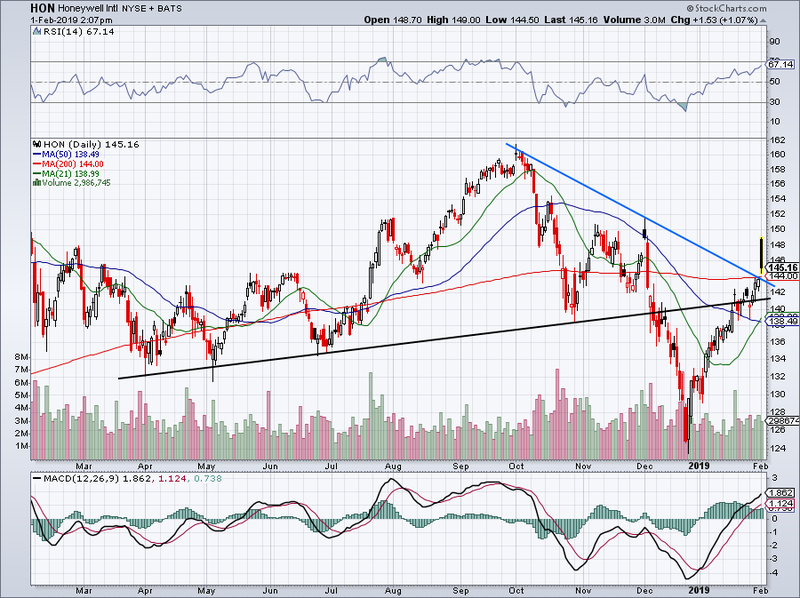 Looming just ahead is downtrend resistance (blue line), which has weighed on CVX since May. I wouldn’t be surprised to see it act as resistance once more, at least in the short term. 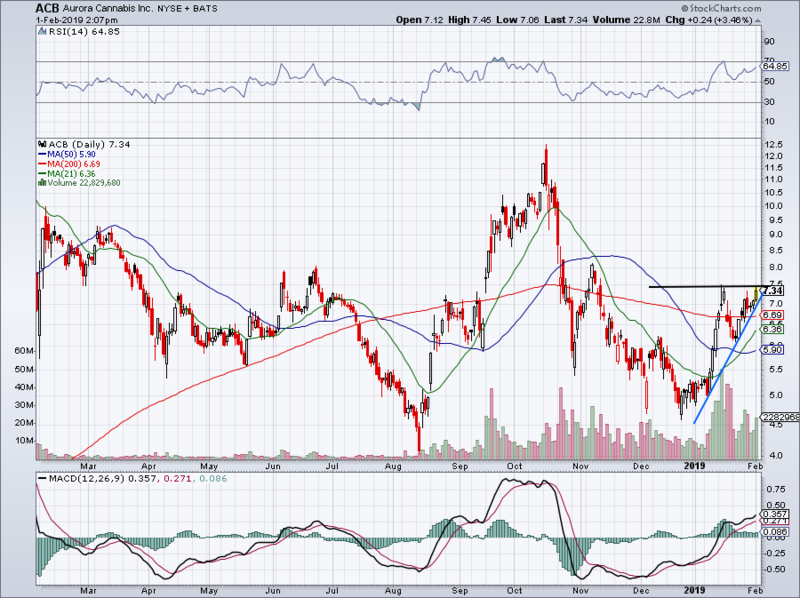 If CVX can push through, it could trigger a breakout. Worries over Honeywell (NYSE:HON) will likely persist until China starts kicking out stronger economic growth numbers. But the company’s better-than-expected earnings report helped relieve a little bit of investors’ worries. While the stock is off its session highs by a decent amount, it’s over the 200-day moving average and downtrend resistance. That makes it a solid risk/reward trade for investors. Over these marks and HON is a long. 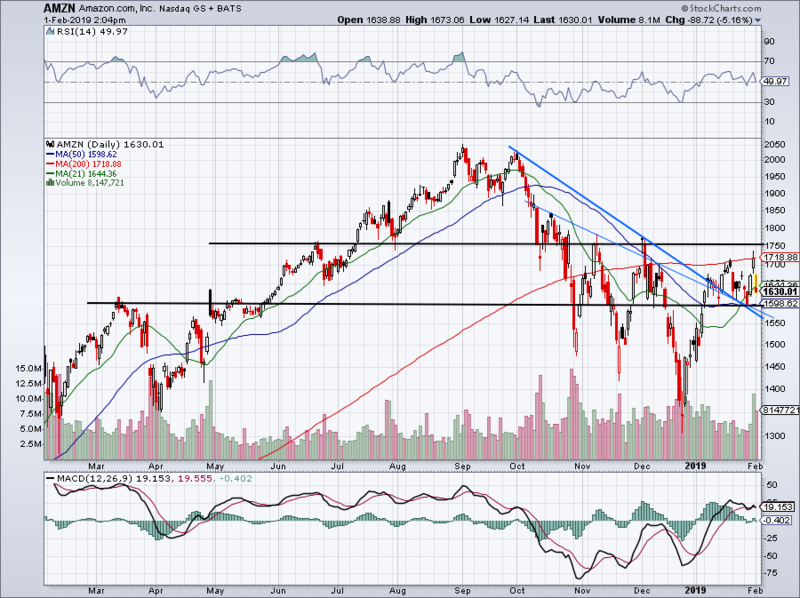 Below and a retest of uptrend support and/or the 50-day is in the cards. We talked about this one in January and it’s paying off big time. Aurora Cannabis (NYSE:ACB) held exactly where it needed to and pushed right back through the 200-day. Now sitting just below the $7.50 mark, a larger breakout could be brewing. The cannabis sector will need to stay hot next week for investors to take advantage, but a big move could trigger in ACB stock over $7.50. General Electric (NYSE:GE) was not able to hold onto all of its earnings-induced gains on Thursday, but the stock is still holding up over the prior session’s low and is sticking above that $10 mark. That’s a good sign for bulls and if GE can consolidate for another day or two, a move higher could be on the table. If it does, look to see how it handles the $11 mark. I would expect it act as resistance. 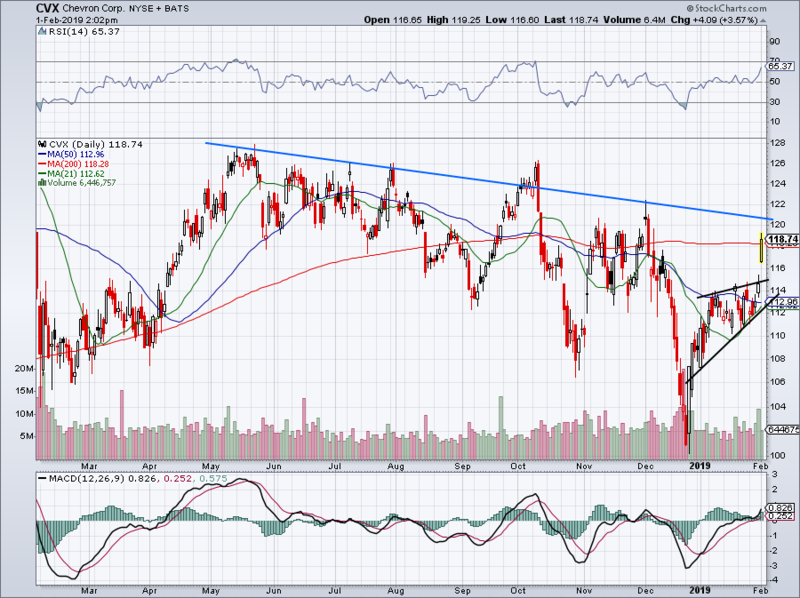 GE is improving but perhaps not to the point where its stock should be up 65% from the lows this quickly. On a pullback, look to see if uptrend support (purple line) helps keep it afloat. 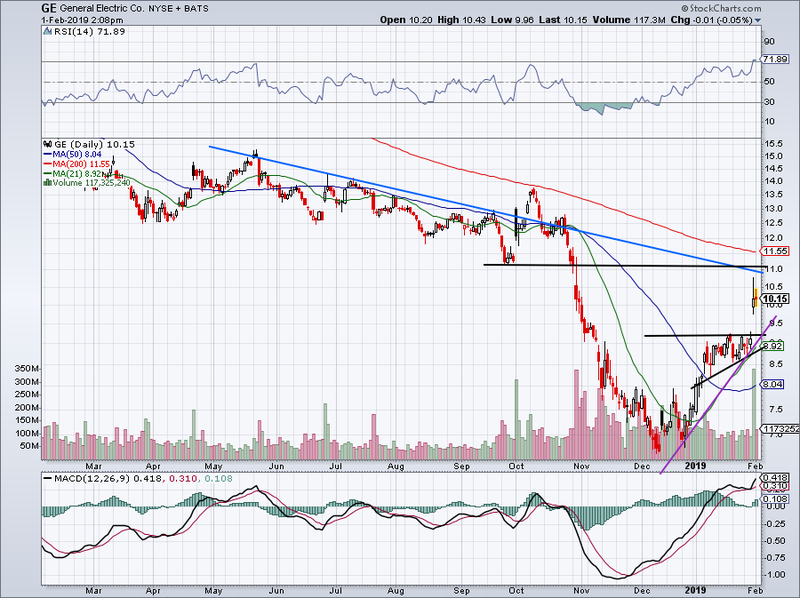 I consider $9 — the prior breakout — the must-hold level for GE bulls. Bret Kenwell is the manager and author of Future Blue Chips and is on Twitter @BretKenwell. As of this writing, Bret Kenwell is long AMZN. The post 5 Must-See Stock Charts for Monday: AMZN, GE, HON, ACB appeared first on InvestorPlace.